Today was another perfect vacation day in DC, warm humid weather and a torrential downpour. 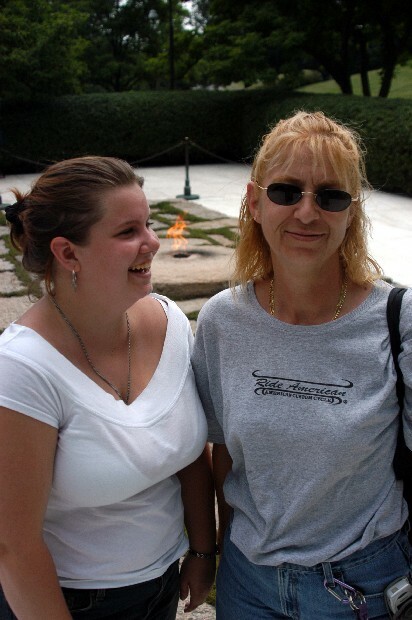 My sister Patti, my niece Carol and I went to see the Woman's Memorial, JFK's Eternal Flame, and The Tomb of the Unknown Soldier, all at Arlington National Cemetery. Luckily the downpour didn't start until we were back on the Cemetery's Tourmobile. The Tourmobile attendants pulled clear plastic screens down to protect its cargo of tourists from the rain, but the storm was too much. It showered in every place possible, half-soaking everyone. No one got off at the following stop because everyone wanted to get back to the Visitors' Center. When the attendant at the Visitors' Center opened the gate on the side of the Tourmobile it must have looked like the start of a very wet horse race. Women and children, men and retirees, were all running with maps and pamphlets over their heads for the crowded overhang of the Visitors' Center. The stampede turned up a casualty. While running, Patti dropped her phone in a puddle. Carol, who was running along side her pointed, "Mom! There goes your phone!" And kept running. Before my sister could rescue it, it had been trampled by the soggy mob.